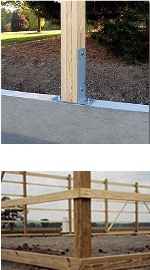 Posts are solid sawn 4 x 6 or 6 x 6 treated depending on the height of the building. #2 Southern Yellow Pine lumber is standard. Truss Carrier (Top Plate) supports the trusses and is anchored to every post by 1/2" lag bolts. Generally double 2 x 10s will be used as truss carriers. Double 2 x 8s or 2 x 12s are also used, based on the width of the building. 2 x 4s spaced 36 inches apart to attach wall cladding to. 2 x 6s are used in some instances. Trusses are typically constructed of 2 x 4 or 2 x 6 rafter and ceiling joist with 2 x 4 braces, and are engineered for the location and the purpose that they are being used. Engineered Trusses will typically use #2 SYP lumber in their construction for the top and bottom chord, and bracing. Standard Truss spacings are 5' on centers. Alternative truss spacings are 2' or 4' on centers. This is based on the spacing of the posts and the use of the truss and building. Standard roof pitch is 4/12. Roof pitches can vary from 2/12 to 8/12 (steeper pitches are more expensive). Roof Purlins are used to tie the trusses together and to attach the roof layers to. 2 x 4s spaced 24 inches apart. #1 American Made Metal, 36 inch wide panel (ribs every 9 inches). 29 Gauge Painted or Galvalume as standard. 26 Gauge Painted or Galvalume available as an option. Manufacturer limited warranty will range from 20-40 years. Screws are used to anchor the metal to the framing. 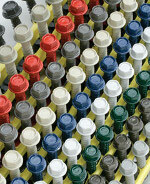 Screw heads are painted to match the metal, and have Neoprene Sealing washers. Lumber is joined by galvanized nails and plates. Truss carriers are attached to poles by galvanized lag bolts.